Ever since Nokia announced the N95 back in September 2006, we knew for sure it was going to be one highly anticipated handset. However, nearly half a year flew past before we got some love from the N95. To most people, this Nokia sounds like a dream come true, with HSDPA, GPS, Wi-Fi, 3G and a 5-megapixel autofocus camera packed into a compact slider. But behind these glossy specifications is a rather disappointing battery life, somewhat sluggish performance and a premium price tag. That said, the N95 will still appeal to tech gadget enthusiasts and, of course, those with deep pockets. The Nokia N95 is one smart phone that just doesn't measure up, especially if you consider all the features in its minute size. Although the N95's footprint is only slightly larger than a credit card, it is thick on the side. In hand, the unit feels surprisingly light. The soft-touch finish on the back is a pleasure to hold, though the plasticky build of the body gives it a less than solid feel. One of the first things we noticed is the sharp 2.6-inch 240 x 320-pixel screen. The LCD held up well under sunlight and the picture display is crisp and clear--an important criteria as a navigation device-- even though it has a nasty habit of holding fingerprints. But what's really unique to the N95 is the two-way sliding mechanism. Sliding the top lid up reveals the alphanumeric keypad, while pushing it in the other direction exposes a column of media playback keys. These buttons are not touch-sensitive although they appear to be. We have to make a conscious effort to depress it in order to register a particular command. What's annoying is when we slide the lid to access the media keys. The screen changes to landscape orientation but doesn't switch back automatically when the phone is closed. We had to push it further to get to the numeric keys before the screen would go back to portrait mode. The numeric keys, on the other hand, have a ridge-like contoured surface which makes it easy for thumbing our messages and they light up in blue when the ambient sensor detects a dark environment. Likewise for the buttons on the top lid. These are large and provide tactile feedback. If we have to nitpick, the controls on the outer ring are a tad too slim horizontally and there's no option to map the buttons to specific applications. There are many things we like on this Nokia: A mini-USB port instead of the proprietary connection for desktop synchronization, a 3.5mm audio jack for our favorite headphones so we don't have to reach for an adapter, an external memory card slot that supports microSD media up to 2GB, and finally, a pair of onboard stereo speakers sitting along the sides. 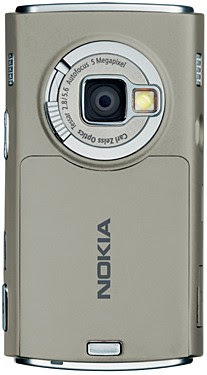 On the back of the handset is where we find the 5-megapixel autofocus camera with Carl Zeiss lens. The ring slider protects the lens from scratches and the integrated flash helps to light up our subjects in dark environments. In use, it's not different from a dedicated digital camera. We could distinctly feel the half-press action to autofocus before actually taking a shot. The N95 is one of the trickiest reviews we've ever written, simply because there are so many features on this slider phone that we're not sure where to begin. Aside from the built-in GPS, a 5-megapixel camera and HSDPA connectivity, attention has also been given to minor styling details--we now have the option of enabling animated icons in the menu and the navigation is also slightly more user-friendly. If you are, or have been, a Series 60 user, you'll probably find the platform somewhat handicapped when it comes to search capabilities. What Nokia has included in the N95 is a new one-stop search application (also available for free download from the Nokia Web site for other S60 devices) that not only ploughs through the handheld for all entries relevant to the search keyword, but is also capable of giving online results via the Yahoo or Windows Live search engines. One of the main draws of the N95 is the onboard GPS receiver. Compared with the MapKing software which HP's iPaq uses, Nokia's Asia Maps (NAVFone Pro) appears far more responsive. There's a bit of a learning curve, but once you get the hang of it, it's quite usable. The female voice guide, aided by a pair of onboard stereo speakers, is concise and audible. It would have been nice if Nokia had bundled in a car kit instead of offering this as an optional accessory. Lacking the gear, the N95 had to be bluetacked to the dashboard and we had to rely on the audio as there was no way to view the screen. A nice surprise: The GPS was able to indicate if a fixed-position speed camera was ahead (test was done in Singapore along the CTE expressway). As expected of a GPS cellular device, the battery was able to sustain only half a day of GPS tracking before it konked out. So the best investment would be a holder with a charging cradle. We didn't get to see what happened if someone had called in while the GPS was in operation. In our tests, the GPS signal dropped a few times but picked up quickly again. Nokia's Asia Maps give alternative routes if you don't like the one it's picked, but typically it sticks to main roads which can be a hassle since these are the most traveled and not always the best way to avoid traffic. At times, the navigator would prepare you for a corner by indicating "prepare to turn right". At other times, it wasn't able to react as quickly to a turn. This could be due to the density of buildings and trees around. The GPS will recompute the route if you go offtrack, though not if you are on a minor street. And it wasn't 100 percent on track all the time. So as long as the user is very clear that the GPS feature is to assist navigation, not replace it, the tracking capability of the N95 is pretty nifty to tote along and impress your passengers with. Overall, it took about 5 to 8 minutes for the onboard GPS to get a successful triangulation, but that's also heavily dependant on the line of sight to the satellites. There are actually two applications on the N95 for your GPS fix. First is Asia Maps, which we've just talked about and is available only in Asia-Pacific countries such as Singapore, Malaysia, Australia, Thailand and India. The other is Maps--the default Nokia application that can be downloaded online. You can use Asia Maps (with turn-by-turn navigation) free for 60 days, after which you'll have to pay for an upgrade that will cost US$29.90 for a lifetime subscription. Maps, on the other hand, comes with free downloadable maps via the Maploader software. Catch is, if you want to use it for real-time GPS tracking, you'll need to pay a fee. Prices may vary depending on where you purchase the maps, but a seven-day license for the Singapore map (which also comes with the Bangkok and Kuala Lumpur cities) will cost S$12. Pay an additional S$3 and you can extend the license coverage to 30 days. A one-year and three-year fee cost S$119.49 and S$139.41, respectively. All local prices mentioned here are inclusive of GST. There's another catch to Nokia Maps (and also Asia Maps). According to the Finnish company, the license fee is linked to your phone's IMEI, so you won't be able to enjoy the maps you bought should you decide to switch to another GPS-enabled mobile. There's always a limit to how many pixels you can pack onto one tiny image sensor before image quality starts nose-diving in low-light conditions for both dedicated digital cameras and camera-phones alike. So it was initially hard for us to imagine that 5 megapixels would be any better than 3.2 megapixels, save for the extra pixels for cropping during post-processing. Surprisingly, we liked what we saw. Image quality was one of the best among camera-phones, with vivid and vibrant colors in daylight. Highlight clipping was evident in heavily backlit pictures, though that was within our expectations. Night photography was where the camera was put to the test. Although we could set ISO to automatic, low, medium or high; noise in the form of multicolored pixels was still evident when we increased the sensitivity levels. Switching to Night scene mode helped a little, but it won't create miracles. The number of settings on the N95 is enough to give a compact digital camera a run for its money. There are so many options available we hardly felt that we were using a camera-phone, if not for the fact that there weren't as many dedicated buttons for various settings and a slightly different user interface. Besides being able to do basic editing on our snaps, we could also upload photos to our Flickr or Vox accounts, create slideshows and albums, share them on Nokia's LifeBlog and print them. Lest the 160MB onboard memory runs out, the N95 has an external card slot that supports up to 2GB of microSD flash media to save our photos, videos and other multimedia files. On the N95, Nokia has also introduced the Video center--an RSS feed reader for videos. At the time of launch, the Finnish company had signed on Reuters and YouTube to bring the latest motion images to the device. The two services work slightly differently, though. Watching videos from YouTube is via direct steaming (read: Heavily dependant on your connection speed) and there's currently no avenue for the user to select the list of videos available for streaming. Reuter's videos, on the other hand, require the user to download the clip via a data connection or Wi-Fi. The N95 is also a bundle of joy as a multimedia player. It plays MP3/AAC/AAC+/eAAC+/WMA/M4A formats with OMA DRM 2.0 and Windows Media Digital Rights Management (WMDRM) support for music. There's also an FM radio, but you'll have to use wired earbuds which double as the antenna. In terms of video, the RealPlayer supports a number of file types including MPEG-4, H.264/AVC, H.263/3gpp, RealVideo 8/9/10. We've said this and we're going to say it again. The experience of watching videos on a compact handheld depends on the screen resolution and onboard speakers. To that extent, the N95 did well. Let's not forget that this Nokia is still primarily a phone. 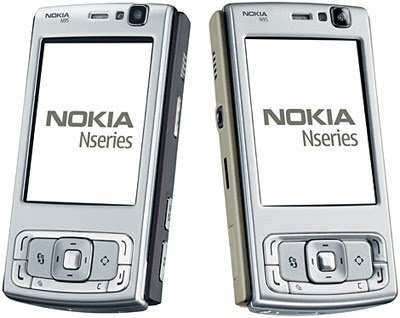 The N95 runs on the robust Series 60 3rd edition. 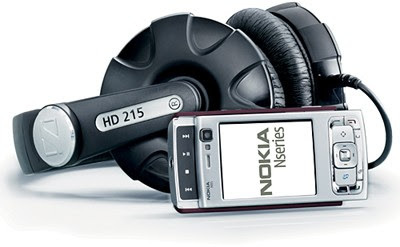 There are many programs available both from Nokia and various developers' Web sites. Aside from being a quadband (850/900/1,800/1,900MHz) smart phone, the N95 is also HSDPA-enabled (WCDMA 2,100). There's also integrated Wi-Fi (802.11b/g), UPnP (Universal Plug and Play), Bluetooth (with A2DP), infrared and a mini-USB port for desktop synchronization. Several applications also come preinstalled on our review unit. Quickoffice (which can be downloaded free from the Nokia catalog) allows us to read and edit Word, Excel and PowerPoint documents. While a 2.6-inch screen isn't the best solution for reading long word documents, it certainly does come in handy if you need to make some minor changes to your PowerPoint presentation while rushing for a meeting. The N95 also allows you to connect to an optional wireless keyboard via Bluetooth, and reads PDF files and barcodes with the Barcode scanner app. We tested the quadband Nokia N95 using MobileOne's service. Overall, call quality was good and our friends reported clear audio even when we switched to loudspeaker mode. In use, the Nokia was slightly sluggish. For example, when we activated the multimedia screen, the phone took a while to return to portrait orientation and the default home screen. Pairing of accessories was also an effortless affair. We managed to pair the Nokia Bluetooth Speaker MD-5W to our N95 and had music streaming through the portable speakers in a jiffy. 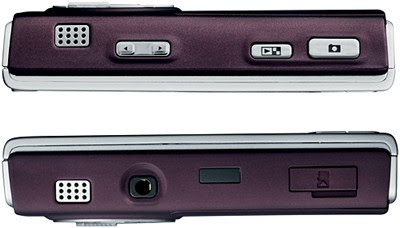 The Nokia N95 is rated for 4 hours of talktime and up to slightly more than nine days of standby time. Battery life test was a little tricky on this Nokia, but if we were to use all the above-mentioned features including GPS, Wi-Fi and music playback (not all the time, but enough to let us have a good experience of each function), on top of sending text messages and answering a few calls, the 950mAH battery couldn't last beyond 1.5 days.